Hello! Now that I have a couple of Whiff of Joy images, I thought it would be fun to participate in the WOJ Challenge this week : ) They challenged us to use green on our card, so I went with this pretty dp from SU Tea Party DSP. I stamped Willow With Umbrella twice, colored her in with Copics, and cut out the top of one of the umbrellas. I framed her with Rectangle Nestabilities. I cut a strip of the striped dp also from Tea Party DSP, and layered that with So Saffron. I added the decorative edge using a Fiskars Border Punch. I added the ribbon and buttons, and it was complete! Thank you so much for stopping by! Kerri, this so adorable!!!! Love the color and patterns, and the coloring with the dimensional umbrella is fantastic!!!! Great card!!! Oh so pretty - like an April showers bring May flowers goin' on with the springy colors. Lovin' that border punch too! Very pretty card. Love the layout & coloring. Wow! This card is gorgeous! DP is so pretty! And coloring is so beautiful! Your details are always sheer perfection, Kerri!! I love the way you popped up the umbrealla for added dimension. Lovely work! what a sweet image and so nicely colored! 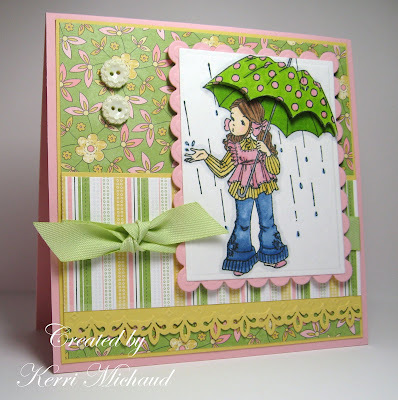 love the popped up umbrella and fun punched edge!